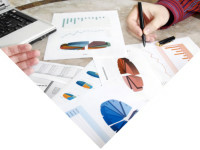 Who is the leading player in product development and realization software? One point of view sees Siemens as a good candidate. 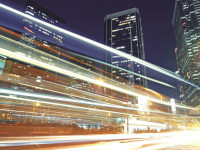 But what is it that puts Siemens’ Digital Factory division–of which Siemens PLM Software is a unit–in this position? 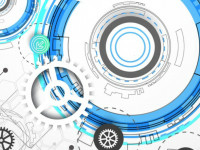 There are many contributing factors, including the broad PLM portfolio Teamcenter, the availability of automation solutions such as Simatic (MES) and the Totally Integrated Automation (TIA) Portal. There is also the fact that Siemens manufactures things. “That’s a tremendous advantage. 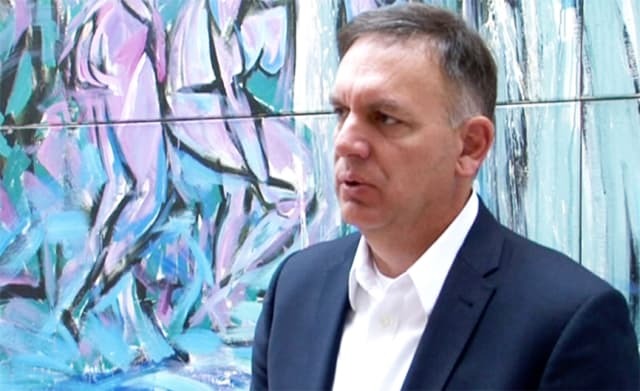 We build things and learn a lot from that; for instance, what it takes to have an entirely digitized factory,” said Siemens PLM Software’s new CEO and president, Tony Hemmelgarn, in today’s PLM TV News report. He is referring to the company’s famous electronic factory in Amberg, Germany. 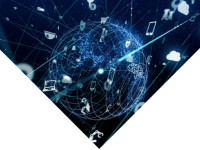 By collaborating and breaking down the departmental silos between PLM Software and Automation, Siemens has come further in its ambitious Industry 4.0 journey than most of the competition. Unlike some competitors, the German giant is more engineering-centric and the team is more practically oriented than visionary. He didn’t say it outright, but the implication of his argument is that tough competitor Dassault Systèmes represents just that kind of visionary overload. Still, he is humble enough to admit that there is still some ways to go before digitized factory concepts and Industry 4.0 become everyday realities. Aero structures developer Sonacas’ director of development, Hugues Langer. This Belgian Tier 1 and Tier 2 supplier to large aircraft manufacturers such as Airbus and Embraer started their digitization voyage in 2013 by replacing their Dassault VPM product data system with Teamcenter. Automotive company Geely Group’s Swedish vehicle platform developer, CEVT’s PLM director, Erik Gräns. In 2013, they succeeded in implementing a complex Teamcenter PLM backbone in just six weeks. Is Industry 4.0 realistic? Or rather, how far away is it? As always, when it comes to disruptive innovative ideas, the time factor is essential. No matter how brilliant an idea is, the industrial impact from the initial idea and hype, to productive installed applications and processes, often takes longer than expected. “It is not good enough to say, ‘I just want to take my existing processes and put them against a digital process.’ While that’s important, I don’t believe that is going to be satisfactory to where customers really want to be in the future. Of course, the existing processes must be digitized, but it is equally important to look at processes from new angles inspired by new technologies. “A good example is around one of our customers, FMC, designing a choke for a pressure drop in their undersea piping equipment,” said Hemmelgarn. PROFITABLE NEW PROCESSES AT FMC. 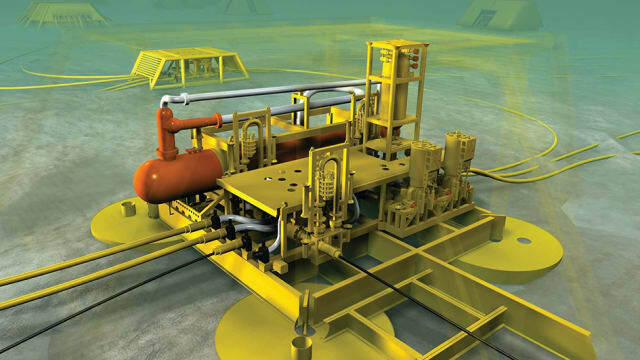 Siemens PLM customer FMC designs, manufactures and services technologically sophisticated systems and products, such as subsea production and processing systems (above). With the help of Siemens simulation optimization tool, HEEDS — which was a part of the German PLM company’s CD-adapco purchase — they were able to perform 300 iterations of an undersea choke design in five days. Previously, they would have done three iterations in ten days. “Think about that differential. If all you did was say, ‘I’m going to keep using my existing process,’ and you didn’t use something like a design optimization tool that optimizes against many variables whether it’s the design, the flow rate or the structural strength. Think about the differential there, that’s what we’re talking about: the game changers that can change the process and make you more effective,” said Hemmelgarn. 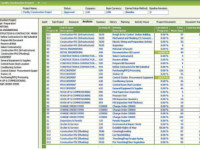 CIMdata analyst Peter Bilello is on the same track. It’s not just about digitizing the existing processes; instead, it is a good idea to seek both processes that are more efficient than the old ones, and also entirely new processes. “If you look at the last 20 to 30 years, people have focused on the idea that they have saved in a file. Unfortunately, files are artificial constructs around information that many times lock information away in forms that not everyone can access,” said Bilello. 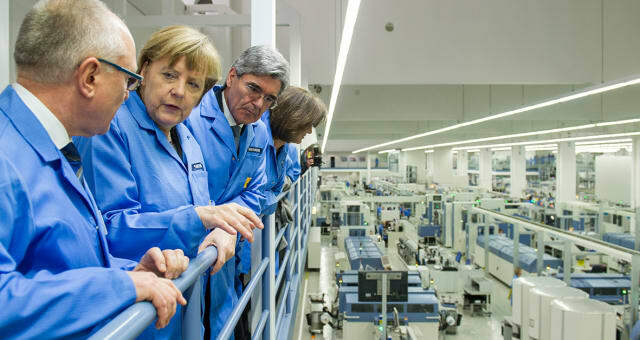 GERMAN CHANCELLOR ANGELA MERKEL WAS IMPRESSED in 2015 by Siemens’ famous Amberg factory. It is a great example of what Siemens can produce in terms of practical, well-functioning Industry 4.0 concepts according to what is possible with today’s best-in-class tools. NX CAD, the Teamcenter PLM suite, and the Simatic MES solutions play key roles in this facility. 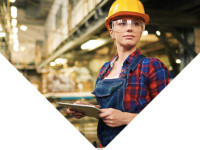 What is the Industry 4.0 Vision? The idea of a digital factory is one of the cornerstones of the Industry 4.0 vision. As mentioned above, Siemens has already come a long way toward this goal at their Amberg, Germany facility. They have implemented their own digital factory concept to manufacture a range of high tech products. While this facility is not large, it produces more than 1,300 different, complex products at a rate of over a million per month. All these products are designed in CAD with NX, managed in PLM with Teamcenter, and produced with Simatic on the factory floor. How does it work? The key is to produce a digital twin of the entire value chain. 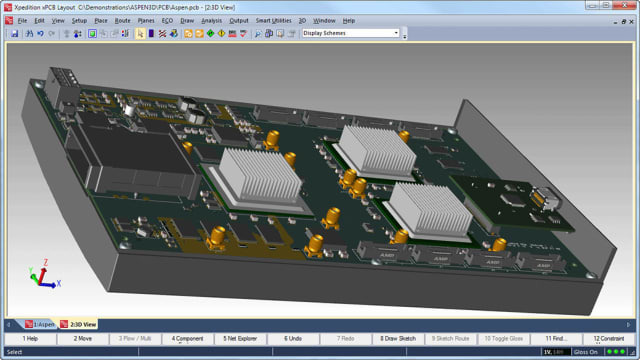 This enables designers, engineers and operators to collaborate within a completely virtual world where they can design, simulate and iterate on the product without creating physical prototypes. 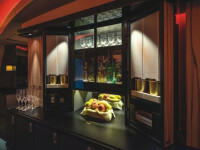 However, the digital twin idea comprises not only the product but also the factory, the equipment and the logistics systems; they can even simulate the people who work there. The result is that the products and their digital twins communicate about how they should be produced, assembled and what resources are required. All this information is contained within the program code of the digital twin, and can directly communicate specific production requirements to the machinery in the digital factory. Halpern also pointed at the hardware side and concluded that Siemens has been fairly innovative with some Industry 4.0 capabilities, such as virtual commissioning. So, how far away is the dream of Industry 4.0? Marc Halpern believes in the Industry 4.0 vision, while stressing that the development of digitized plant concepts has just started. “I would say that the media is promoting it more heavily than companies actually are adopting it. 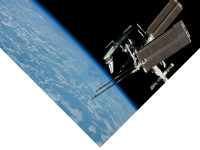 And the vendors are also promoting it more heavily than customers are adopting it,” Halpern said. Tony Hemmelgarn shares Halpern’s views, and shows no signs of long-term hesitation; Industry 4.0 will become a reality, the only question is when. There’s still a long way to go, Hemmelgarn explained, claiming that the secret of success is about integration between what you have and what you want. In this context, Hemmelgarn points to the three phases of ideation, utilization and realization. Companies that can put that all together can reach unexpectedly high productivity wins, versus just looking at components. The key is platform thinking, openness, and accessible file formats. A GROWING MARKET. 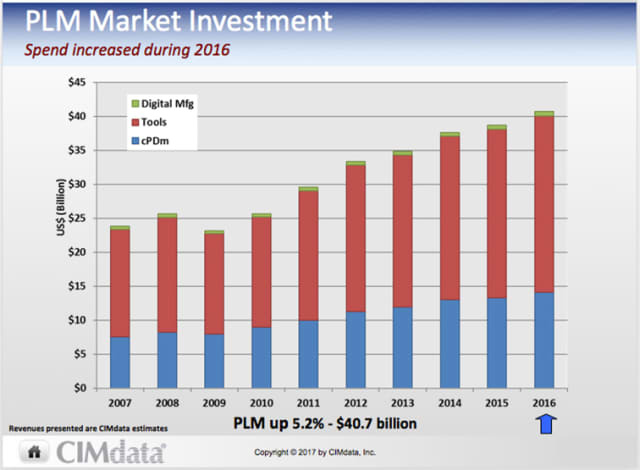 According to analyst CIMdata, the market investment in PLM increased with 5.2 percent up to $40.7 billion dollars. Tools, such as CAD and CAE applications, and cPDm represent the largest portions of these investments; while digital manufacturing solutions, such as Siemens Tecnomatix and Dassault’s Delmia, still have a much smaller share. In terms of revenues, Siemens does not reveal breakout numbers for departments such as its PLM software division, said Tony Hemmelgarn. 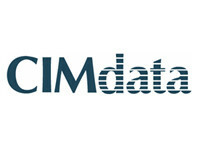 However, CIMdata in their preliminary numbers calculates that Siemens PLM reached more than $2.0 billion in direct software revenues during 2016. In reality, the numbers are significantly higher because Siemens' revenues only included some of CD-adapco's 2016 numbers since the acquisition didn't finalize until later in the year. Also, their numbers don't include any 2016 Mentor Graphics revenue. These will make a huge impact on CIMdata's Siemens PLM revenue estimates for 2017. To find out how these solutions will generally impact Siemens’ market offerings, watch the TV report above.